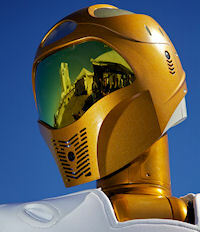 January 31, 2011: NASA's Robonaut 2 is primed and ready for launch aboard space shuttle Discovery in February. R2 is so ready, in fact, that it's going up ahead of its legs, which will follow on a later launch. Waiting for launch, R2 regards the Vehicle Assembly Building at KSC. Photo credit: Joe Bibby. "The robot's legs aren't ready yet," says Rob Ambrose of NASA's Johnson Space Center. "We're still testing them. But there will be plenty for R2 to do while waiting for its lower extremities." 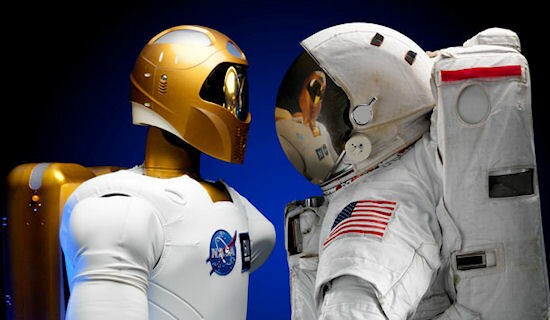 R2 will be the first humanoid robot to travel and work in space, so it'll be training for some big responsibilities. Thanks to the legs and a few other upgrades, "it" has a bright future. In fact the ultimate goal is for R2 to help the astronauts with EVAs. But first, like a student in school, the robot must progress stepwise as new features – like legs -- are added and it acquires new abilities. "For its first training sessions, R2 will be placed on a fixed pedestal for lessons on a task board. The board has switches, knobs, and connectors like the ones astronauts operate, and the crew will mock up chores for R2 to master." Once the legs are added, the trainee will be able to move around inside the station, wiping handrails, vacuuming air filters, and doing other mundane tasks for the crew. "Much like those of us down here on Earth, space station astronauts spend their Saturday mornings cleaning. R2's legs will give the crew their Saturday mornings back! It's all about making efficient use of the astronauts' time. They don't need to waste time doing simple stuff R2 can do." The legs have special toes that plug into the space station walls so R2 can learn to climb without using its hands. "The hands must be free to carry cleaning supplies and tools," explains Ambrose. "Remember, robots don't have pockets to put things in." But there's another reason for the climbing lessons. R2 must become an expert "no hands spiderman" before it can graduate to its most critical duties: performing EVAs. "R2 will practice indoors first because if it falls off inside an astronaut can pick it back up for another try. With a misstep outside, R2 could end up dangling helplessly out in space on a tether." Once the robot is climbing well, a new computer upgraded with software enhancements will be sent to station. The crew will exchange it with the one now in the R2's chest. The ground team is also working on a battery for R2. At present, the humanoid has to plug in like a lowly toaster. "We want to give R2 more and more freedom, so we're eliminating the need for cords and cables." 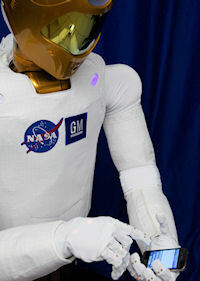 Robonaut 2 is now tweeting at twitter.com/AstroRobonaut. After all these upgrades, the robot will be able to set up EVA worksites. R2 even has "eyes" (two video cameras that give it three-dimensional vision) for viewing an external worksite before the crew heads out to tackle a job. "If the crew sees a need for certain tools or for 'fine tuning' the work station, they can direct R2 to make the changes and lay it out just like they like it. It's kind of like a nurse setting up for a surgeon. The crew can then come in and do the job quickly, and complete multiple jobs in less time." And in the event of an emergency, R2 can be a first responder. "It can get outside in a hurry to check out a problem. Astronauts have to suit up and then depressurize in the airlock for hours before venturing out." While they're depressurizing, the crew can view the problem through R2's "eyes" and determine the approach and tools they'll need to resolve the emergency. "Also, R2 can stay outside working as long as necessary, while humans can stay only a limited time." What other adventures are in store for R2? "There are so many possibilities for the future," says Ambrose. "For instance, we could add wheels so R2 could scout a potential landing site on a planet or an asteroid or set up a workstation or habitat there. Someday R2 may even get a jetpack! But we have to crawl before we can fly." Credits: R2 was developed jointly by NASA and General Motors.